Jeff and I went to my cousin’s high school graduation party on Sunday. Maile will be going to Hawaii Pacific University on a softball scholarship. It was nice to meet with all my family here in California. The Kawaakoas are always very friendly. The party was at Bayonet Black Horse Golf Club. One of the courses was under construction at the time, so a lot of the grass was torn up. I thought the food was pretty good, but I don’t think Jeff thought it was as good as I did. Maybe I was just hungry. We got to take home a centerpiece! 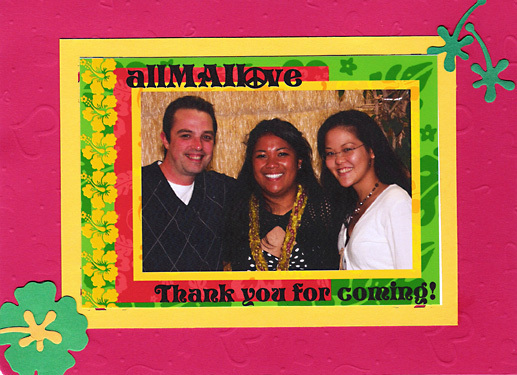 Here is a pic of Jeff and I and Maile. They where taking photos after dinner and made this nice frame for us to take home.